TL-5242/W (SL-360/461, B9593T) Replacement Lithium Thionyl Chloride 3.7V PRAM, RTC, CMOS battery. Type: Lithium Thionyl Chloride. Voltage: 3.6V / 3.7V. Capacity: 1Ah. Length: 51 mm. Height: 18 mm (including velcro). Width: 15 mm. Price: £17.33 each. (£17.00 if you buy two or more). Postage and packing included. Functional replacement for: Tadiran TL-5242/W, Saft T1AA-C, Eternacell B9593T, Hawker B9593T, Fedco B9593T, Energy+ B9593T, Sonnenschein SL-360/461. a 4 pin Berg-type connector (with one socket closed off to ensure correct polarity). a velcro mounting system (hook and loop fastening) to attach the battery out of the way on the power supply or case. Some computers do not protect their CMOS batteries with an on-board diode. The machines require a battery such as the Keeper II LTC-16P-CO-S8 or similar. Such a battery has a protective diode built into it. 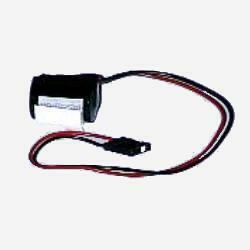 Our Tadiran TL-5242/W compatible CMOS battery is not suitable for this type of machine.